Gosh, just where did September go this year? There’s been a serious change in temps in the garden today and it’s been pretty gusty out there tonight too! Some tender plants got lifted and potted up to spend a winter holiday in my tiny greenhouse. Can’t believe how quickly the feel of the garden has changed in a day. Hi Shirley, Good to see you back. You should be ready to tackle the fall chores in the garden after your holiday. Can't wait to see details. Would it be Newcastle, home of The Magpies football club? Lisa, thanks, it’s good to be back. Yes, absolutely getting stuck into the autumn garden jobs when the ground is still warm. Delighted to have some gardener’s gold to use this weekend! Our local amenity rubbish/recycling centre has a skip of fresh dark compost (free of charge) at the moment – it never lasts long as you can imagine. By chance I was down there yesterday (on pond work clearance) and took away the allowed allocation per day. You won’t be surprised to hear I returned this morning at opening time to get some more! I’m very happy to do some weeding now knowing I have a great mulch to put down after making the garden look pretty well at a time when it can look tired. Yay – the garden is refreshed and great to think that garden material I added to the skips down there have added to mixes like this. Can we have a clue is it a near or far destination? Is it one of the Scottish Islands? You are a tease... and I have absolutely no idea whatsoever. I hope is a lovely place. Spot on with Skye, Sue :-D This photo was taken at Portree harbour. We saw this bird on moorland and around our pretty white holiday cottage where it was always on the move. 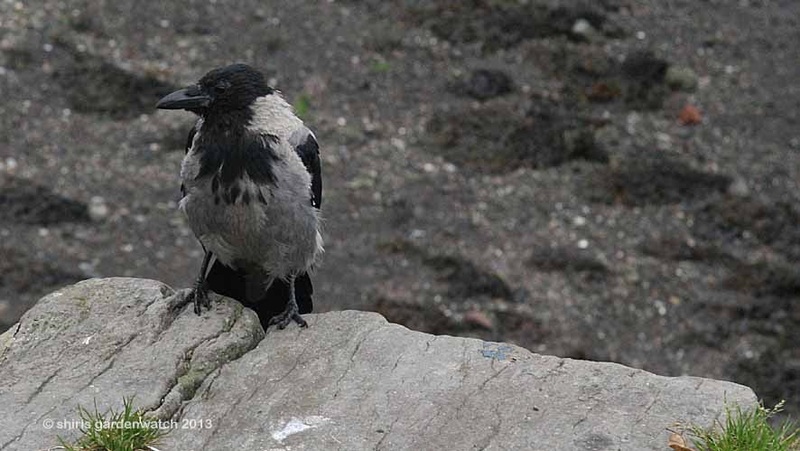 I guessed it was a Corvid and searched my phone for an ID and discovered it could be a hooded crow but needed photos to be sure. I thought the bird ID would be a slight clue with its general resident distribution being Ireland and the west of Scotland and the Islands.